For the primary formation of ice crystals in clouds in the temperature range between 0°C and roughly -38°C, catalysts are needed which can initiate the nucleation of ice in a liquid, supercooled drop. Atmospheric particles that can act as such catalysts are called ice nucleating particles (INP). 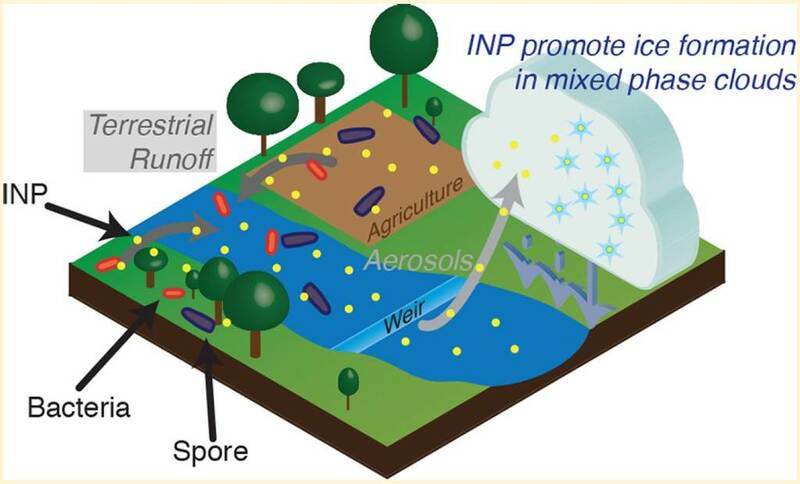 Atmospheric concentrations of INP have been determined by TROPOS in a series of measurement campaigns at various locations around the world. Atmospheric filter samples were collected and evaluated in the laboratory. 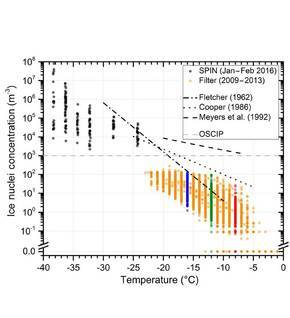 Off-line instrumentations were used, which can provide data in the temperature range from 0°C to approx. -25°C (the statements below therefore generally refer to this temperature range). The obtained data are among others important input parameters for climate models and can help to improve future model calculations. 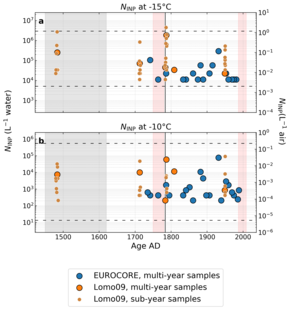 i) Cooperation with PSI glaciologists in Switzerland, to measure INP in samples of two Arctic ice cores; no significant increase in INP concentrations compared to today was found in the period studied (past 500 years); on short time scales (samples than were less than one year long), INP concentrations showed a significantly higher scatter compared to perennial samples; oberall, the observed scatter in the data remained within that observed in current data. 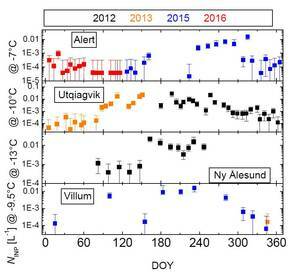 Time series of INP concentrations at four different Arctic stations. ii) Cooperation with partners from four different Arctic measuring stations (Alert, Ny Alesund, Utqiagvig (formerly Barrow), Villum Research Station); yearly variations of INP concentrations were found, with high values in summer and lower values in winter, which was particularly pronounced for very ice-active INP. Possible sources for the highly ice-active INP (presumably biogenic in origin) were identified in the Arctic (both terrestrial and maritime sources) (Wex et al., 2018). iii) Sample collection at Villum Research Station, both ground-based and on board the Polar 5 aircraft of the Alfred-Wegener-Institute in the framework of the PamArcMip campaign in March/April 2018. On some days, increased INP concentrations were found - a biogenic origin of these respective INP is expected. 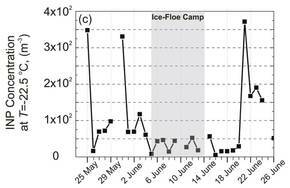 INP concentrations as obtained during the Polarstern cruise. 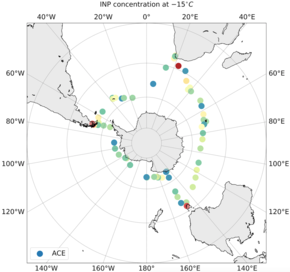 iv) Sample collection during a voyage of the German research vessel Polarstern within the framework of (AC)3 (project B-04) in May - July 2017 - generally low number concentrations of INP were observed over the sea and the ice and higher number concentrations near land. First data were published as part of a campaign overview (Wendisch et al., 2018). 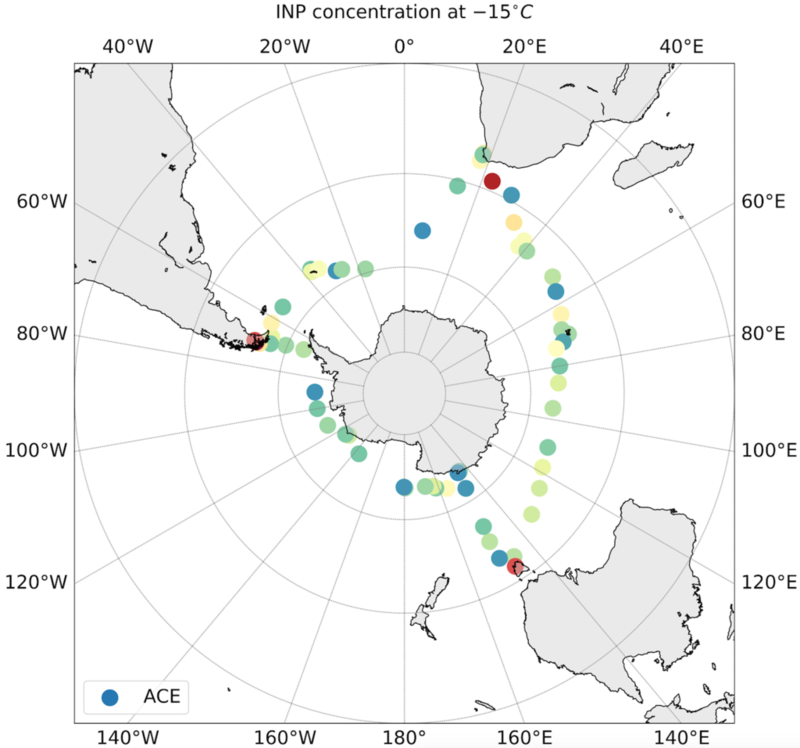 INP concentrations as observed during the Antarctic circumnavigation. - Antarctica: Sample collection in the Southern Ocean during a circumnavigation of Antarctica (including the trips from and to Bremerhaven, Germany) within the ACE-SPACE campaign from Nov. 2016 to March 2017; INP concentrations were generally low, with higher values observed near mainland (islands and continents). Figure from Welti et al. (2018) showing INP concentrations as measured on the Cape Verde islands. 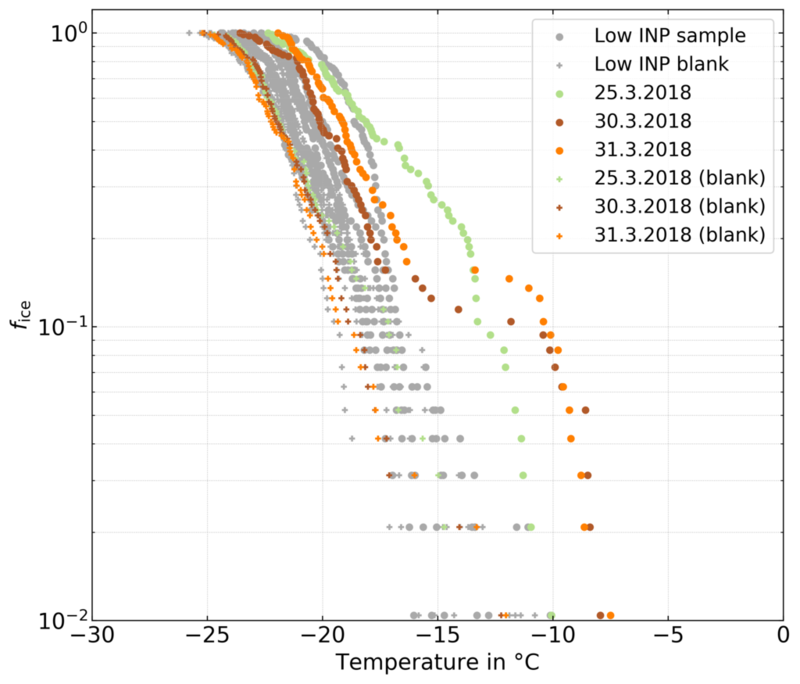 4 years of continuous filter samples (2009-2013) showed increased INP concentrations in combination with Sahara dust for INP active at lower temperatures (< -16°C). A source assignment for INP active at higher temperatures was not possible. 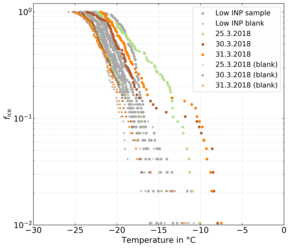 A log-normal distribution of the INP concentrations, as observed at different separate temperatures, suggests that the INP do not originate from local sources, but from a number of different sources whose contributions were randomly turbulently mixed during transport (Welti et al., 2018). Within the framework of MarParCloud, INP concentrations were determined for various samples: Ocean water, oceanic surface micro layer (SML), in cloud water and in the air at two measuring stations (sea level and at an altitude of 700m on a mountain). Figure from Chen et al. (2018) showing INP concentrations measured in Beijing in comparison to other parameters. 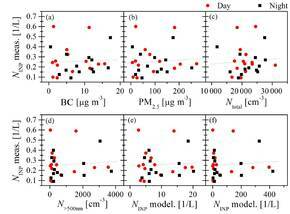 - Beijing: Investigation of INP in atmospheric aerosol that was, at times, strongly influenced by anthropogenic pollution; it was found that no additional INP were introduced into the atmosphere even during phases of strong air pollution, i.e. 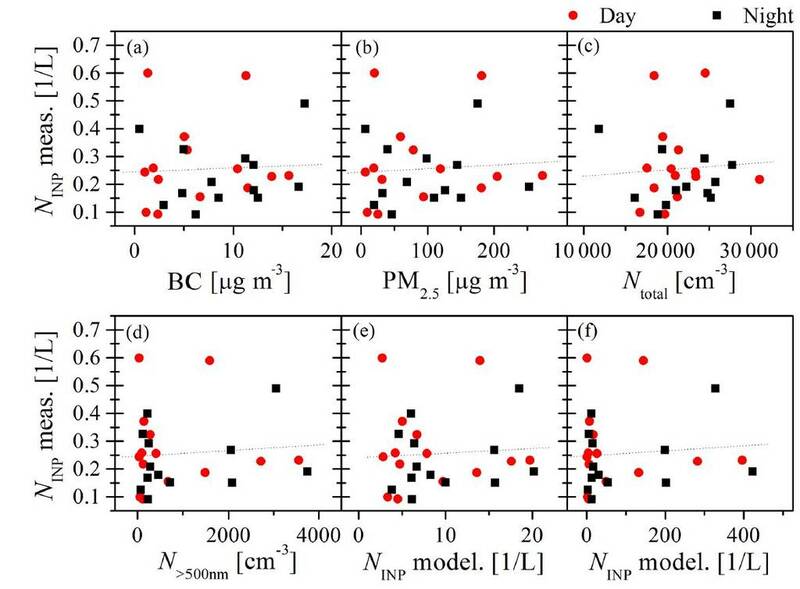 that anthropogenic particles in Beijing did not function as INP in the atmosphere (Chen et al., 2018) (in the investigated temperature range). Conceptualized sketch from Knackstedt et al. (2018), showing the circulation of biogenic INP in nature. - Maumee River and Lake Erie (US): The farmland surrounding Maumee River was identified as the source of biogenic INP in the river (possibly the soil fungus Mortierella alpina). In Lake Erie (into which the Maumee River flows) additional different biogenic INP were found. Atmospheric INP concentrations above a weir were elevated compared to the surrounding area, suggesting an input of INP from the river (Knackstedt et al, 2018). - Zypern: Filter samples were collected both in the framework of a joint INUIT/BACCHUS-campaign (April 2016) as well as during A-LIFE (April 2017).